According to a new market report published by Transparency Market Research “Gas Detection Equipment Market - Global Industry Analysis, Size, Share, Growth, Trends, and Forecast 2014 - 2022”, the global gas detection equipment market is forecast to reach US$ 3,372.0 Mn by 2022. Key factors driving the growth of global gas detection equipment market include increasing concerns about occupational health and safety coupled with rise in demand for wireless gas detectors market. The increase in demand from oil & gas industry is another factor driving the market for gas detection equipment. The global gas detection equipment market was valued at US$ 2,196.0 Mn in 2013 and the market is forecast to grow at 5.0% CAGR from 2014 to 2022. Increasing adoption across varied end-use verticals, especially oil & gas and building automation is expected to fuel market momentum. In terms of end-use, the industrial segment held the largest revenue share and was valued at approximately US$ 794.5 million in 2013. However, the building automation segment is expected to witness the fastest growth, at a CAGR of 6.6% between 2014 and 2022. Fixed gas detection equipment was the largest product segment, accounting for around 58.4% of the overall market revenue in 2013. However, portable gas detection equipment are poised to exhibit maximum growth over the forecast period. The market for portable gas detection equipment is mainly driven by growing preference for flexible, portable equipment for gas leak detection, especially in confined areas with limited access. In terms of geography, North America and Europe were the two largest contributors to the global gas detection equipment market in 2013. However, over the forecast period, Asia Pacific, Middle East, and Latin America are expected to exhibit robust growth. The market for gas detection equipment in Middle East and African countries such as Saudi Arabia, Iraq, and United Arab Emirates is driven by the demand from oil and gas industry in the region. 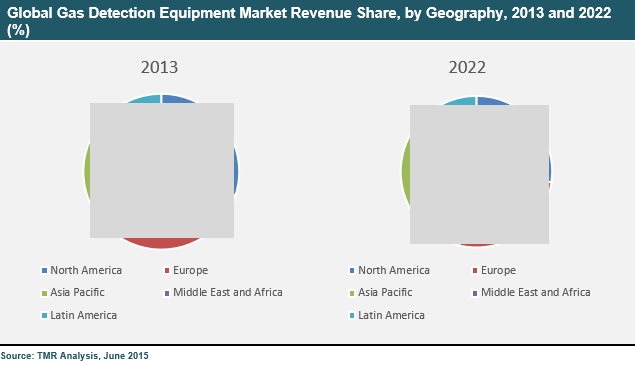 The global gas detection equipment market is highly fragmented and competitive. Major industry participants include Drägerwerk Co., Industrial Scientific Corporation, Siemens AG, Honeywell Analytics, Mine Safety Appliances, and RAE Systems, among others. The report studies the global gas detection equipment market, and provides estimates in terms of revenue (US$ Bn) from 2014 to 2022. Market estimates on the basis of end-use, technology type and product type have also been provided for each region.